Zaha Hadid Architects has unveiled a set of glasshouse-like technology buildings and a slatted-timber footbridge, which will join its wooden football stadium on a eco park in Gloucestershire, England. The humpbacked bridge will span a motorway to link the two parts of the Eco Park near the town of Stroud: one area dedicated to sports and another for technology. The London-based firm has designed the primary components for both areas of the park. 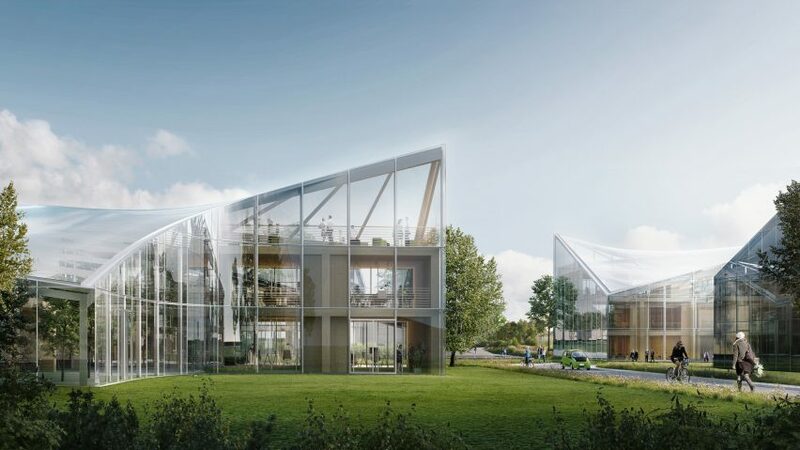 Having previously released plans to build the world's first timber football stadium there, the studio is now proposing a series of glass and slatted-timber buildings for the park's Green Technology Hub. Strips of timber covering the facades of some of the buildings in the technology hub match the materiality of the bridge and the undulating bowl of the stadium, visually tying the sporting and technological elements of the site together. "The Green Technology Hub proposals apply the latest sustainable design technologies with ecologically sound materials and construction methods to create an integrated community for world-leading research and development," said Zaha Hadid Architects. "The bridge design creates one single, fluid form by fusing together individual timber elements," added the studio. "This important, unifying gesture builds connections for the community, conveying Eco Park as a facility for all." Zaha Hadid Architects won an international competition for stadium, which will provide a home for National League football team Forest Green Rovers, late last year. Designed to be the world's greenest football stadium, it will be constructed completely from wood and powered by sustainable energy sources. The stadium and the 100-acre Eco Park development were commissioned by renewable energy company Ecotricity, with aims to be carbon neutral or negative by generating energy onsite. Zaha Hadid Architects won an international competition for the wooden football stadium for the Forest Green Rovers football team late last year. "With Eco Park we hope to push the boundaries of sustainable development, create 4,000 jobs in the green economy, a world class football stadium and make more room for nature with a big biodiversity boost, as well as creating a new 'gateway to Stroud'," said Ecotricity founder Dale Vince. Ecotricity expects to be granted outline planning permission for the Eco Park development this summer.